begins at 12:00 AM ET. No additional information is required to enter. b. Any entries submitted after the deadline specified in section 1a will be ineligible. c. Limit one (1) entry per person for the entire sweesptakes. considered for the Prizes (Section 3). eligibility restrictions & conditions (Section 4). below). All decisions shall be non-reviewable, final and binding. Sweepstakes entry form, on or about January 15th, 2018 by Sponsor or Administrator. Facebook which shall include an e-mail address to coordinate further communications. Festival in Spicewood, Texas plus hotel and flight accommodations. e. Odds of winning depend on the number of eligible entries received. acceptance and/or use of the prizes not specified herein as being awarded. g. Limit one (1) prize per person for the entire sweesptakes. sole discretion and strict compliance with these sweepstakes rules. contiguous U.S. states and the District of Columbia. (collectively, the “Promotion Entities”), are not eligible to enter or win. intervention, or technical failures of any sort. required to award a substitute prize. solely at the discretion of Sponsor. 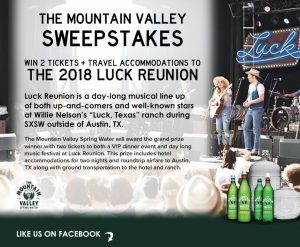 Facebook or Luck Reunion music festival. j. Sponsor will not sell or intentionally distribute your information to any third party. Sponsor or Administrator will select a new Winner via the process outlined in Section 2.
l. Sweepstakes is subject to all applicable federal, state and local laws. sweepstakes and the Released Parties’ use of any of the rights granted herein. to have damages multiplied or increased.